Christmas cactuses are asy to care for and bloom brightly during the holidays. Photo Jupiter ImagesPeople say poinsettias can be coaxed into blooming year after year during the holiday season, but you couldn’t prove it by me.I am coming out of the closet, dead poinsettias in hand. I’ve diligently stored them away in the far corner of the spare bedroom closet, per directions, in the fall, taking them out for the requisite “short period of daylight.” The results have consistently been a pile of dirt on the closet floor and a shriveled plant that’s unlikely to ever bloom again. Apparently I’m not the only one who has come up on the short end of the poinsettia stick. While giving careful instructions, the Ohio State University extension center fact sheet admits, “The results are usually not good.” Other gardening experts call them “finicky” and “very difficult” to keep going from one holiday to the next. Fortunately poinsettias are inexpensive, so amateur horticulturists like me can fill our houses with them and then say good-bye when they finish blooming.And, fortunately, there are other options to indoor winter bloomers. For those who want to keep holiday plants from year-to-year, Christmas cactuses are another option. Although they, too, have been called fickle, local April Cretney has had one since she was a teenager. In fall, it looks straggly, but by the holidays, it dominates the room. Three feet in diameter and covered with flowers, it makes even her Christmas tree pale by comparison. “It brightens up the whole house,” Cretney says. “It’s very colorful and it’s nice to have live blooms in the middle of winter.” Unlike the high-maintenance poinsettia, her Christmas cactus requires only basic care. “I really don’t knowhat I’ve done to make it live so long,” she says. Not only is the plant a Christmas showpiece, but – hanging in front of a windothat gets mostly indirect light -- it blooms again at Easter. So I’m convinced. This year, I’m going to buy one. I’ll probably also place red, pink and white poinsettias throughout the house, but when the holidays are over, I’ll be guilt-free when I plant them in the dumpster and hang the Christmas cactus in the window. Nothat’s Christmas cheer. Live Christmas trees: These need time to adjust from outdoor temperatures to indoor warmth and dryness. Although they require care, with previous ground preparation they can be planted after the holidays and serve as a living reminder of the holidays. Ivy: Easily grown indoors, ivy plants like direct sunlight, but can withstand indirect light too. Pinch off stem tips to induce bushiness. Amaryllis flowers: These bulbs are easy to grow, have huge colorful flowers in red, pink, white and orange, and bloom like no other bulb. 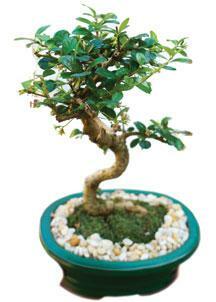 Usually a bulb will produce one or two tall flower stalks, each featuring up to four flowers.Bonsai trees: Miniature versions of Christmas trees, these little trees fit on a table, desk or windowsill. Decorated with ribbons and small ornaments, they add to a festive atmosphere during the holidays, and then live on, sometimes for decades. Paper whites: A pot of paper whites makes a decorative holiday gift. 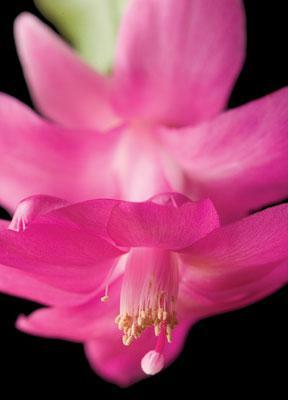 Easy to grow, these fragrant flowers bloom within six to eight weeks of planting the bulbs. Add a single red boamong the pure white blossoms to complete the package. Supplies you'll need include wire, straw, grapevine or twigs for the frame; wood picks and florist wire; a glue gun; fresh greens; and decorations. Photo Deborah OlsenPine cones and sleigh bells, pomegranates and tree boughs, pheasant feathers and old-fashioned ornaments...any of these personalize a family’s holiday wreath. While it’s lovely to buy a wreath, especially when it’s being sold as a fund-raiser, making one at home can become a holiday tradition. “I love making my own wreaths,” says Susanne Bostrom of Alpine Floral & Atrium, who has taught wreath-making at Colorado Mountain College over the years. “They’re less perfect than the ones you buy in a store. They’re a labor of love and they last forever.” Want to make your own? Bostrom takes us through the process. Begin by gathering fresh pine boughs. These can be the lower branches trimmed from a Christmas tree. For a wreath of fresh greens, use a sturdy wire frame so the piece will hold its circular shape. Start with the heavier fronds, and use the rougher pieces first. Go all the way around, tying each branch to the frame while bending it to fit the curve. Overlap so each nefrond covers the base of the previous one. Once a thick circle of greenery is in place, begin adding accent pieces. “Try to use natural things – they’re the nicest,” Bostrom advises.One option is to collect dried plants, grasses and seeds like yucca pods, which can be found in South Routt County. Spray weeds with a clear sealer to keep them from shedding. 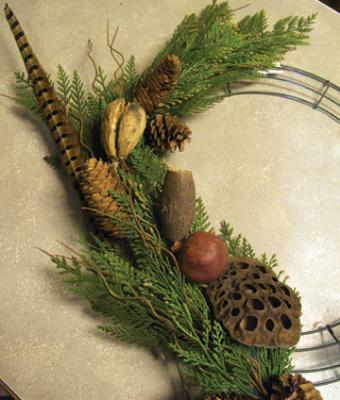 Nuts, pomegranates and pinecones also make good additions to a wreath of fresh greens. Ribbons, ornaments and candy canes are commonplace decorations for wreaths; feathers, miniature children’s toys or even small cowbells are more creative options. Swags, or sprays of greenery, are an attractive alternative to traditional circular wreaths. To make a swag, begin with a particle-board base for hanging. Glue Styrofoam or Oasis solidly to the wooden base, and insert greenery into it.Steamboat Springs’ wintery weather can be hard on wreaths and swags. Make certain fronds and accent pieces are securely fastened to their frames, and realize that some materials, especially glue, can disintegrate over time from the cold. While traditional wreaths are made of fresh greens, pinecones, wine corks, straand even willobranches also make remarkable pieces. Whether customary red-and-green or custom-tailored to reflect individual style, a wreath in the doorway greets friends and family with holiday cheer.